Protein rich meal for an ideal weekday dinner. 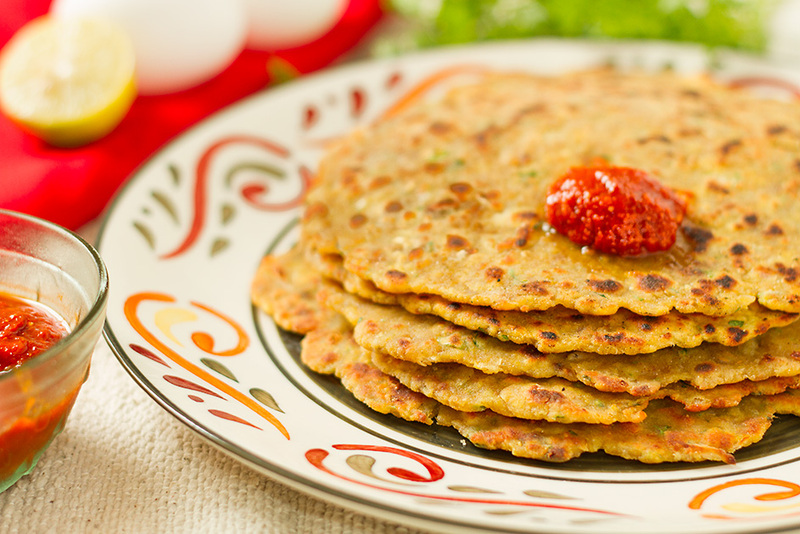 Of all Indian recipes, Roti or Flatbread is one thing that is made fresh everyday. But if you want a protein packed Indian meal, try making this protein rich Chicken Missi Roti. The Missi Roti recipe originates from Punjab and is so called because the dough uses two types (or more) of flours. Adding Chicken to the dough increases the protein quotient of this very popular dish. While traditionally the missi roti is served along with curries and that makes it a heavy meal. But the Chicken Missi Roti can be an excellent meal in itself on working weeknights. If you want to make a healthier version of Missi Roti, skip oil while shallow frying. just use the hot pan to cook the roti. The word roti is derived from the Sanskrit word रोटिका (roṭikā), meaning “bread”. Roti is an Indian Subcontinent flat bread, made from stoneground wholemeal flour, traditionally known as atta flour, that originated and is consumed in India, Pakistan, Nepal, Sri Lanka and Bangladesh. It is also consumed in parts of South Africa, the southern Caribbean, particularly in Trinidad and Tobago, Guyana, and Suriname, and Fiji. Its defining characteristic is that it is unleavened. Indian naan bread, by contrast, is a yeast-leavened bread. A kulcha in Indian cuisine is a bread-like accompaniment, made of processed flour (maida) leavened with yeast. Various types of roti are integral to South Asian cuisine. Mix the flours, salt, turmeric, chat masala, green chillies, dried pomogranate seeds, onion, coriender, minced chicken and egg. Mix everything well and knead it into a dough. You should not need any water for kneading. As you finish kneading, apply 1 Tsp oil on your palms and knead the dough a bit more. Roll out one ball at a time into thick roti and shallow fry it over a hot tava (a flat iron pan). Drizzle oil as each side gets cooked, keep the flame on medium. The Missi Roti is done when brown spots appear all over. Serve Chicken Missi Roti with any non vegetarian curry, or eat it with a chutney of your choice for brunch, or give it to your kids as a healthy after school snack.